The Grandview School District has an app. You’re invited to visit the App Store/Play Store and download our brand new Grandview School District app. The app allows you to get push notifications from your child's school, be the first to know about school delays and cancellations, it gives you a direct link to your student's teachers and school calendars are now in the palm of your hand. The app also gives parents, employees and community members a place to go find information on our GHS and GMS sports, our GHS construction project and so much more. We invite everyone to download the app and give it a try. Click story for more information. McClure Elementary School is saving pull tabs from aluminum cans. The school saves the tabs all year long and donates them to Ronald McDonald House of Seattle and Spokane. So be sure sure and save your tabs! Drop-off containers are available throughout the school. Stay connected, follow the district on social media and catch up with district news on your phone. 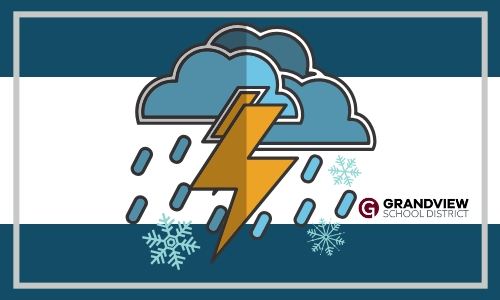 It's now easier than ever to stay connected and learn the latest about what is happening in the Grandview School District. Be sure to follow the school district on Facebook at @gsd200, and on Twitter and Instagram @thegsd200.